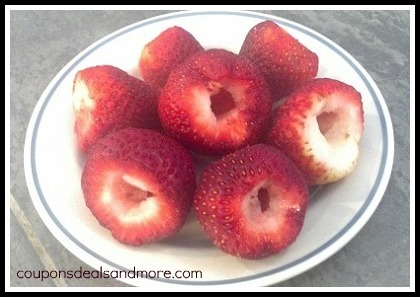 You’ve probably looked at a recipe for a jam, pie, tart, etc that has as an ingredient “strawberries, hulled”. 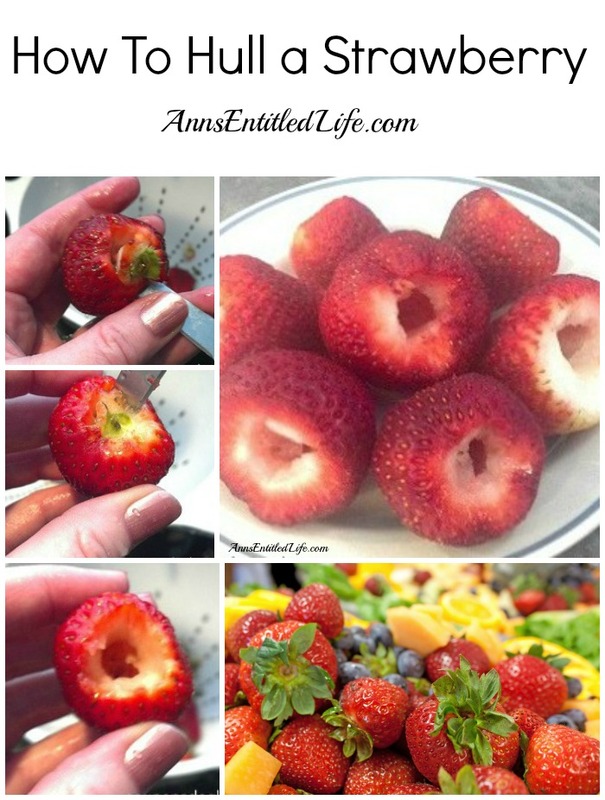 If you ever wondered what hulling meant, it is basically removing the leafy part and the stem that is attached, of the strawberry. You can purchase a strawberry huller to do the deed, or use a paring knife to quickly remove the stem left inside the strawberry. • Remove the surface leave. 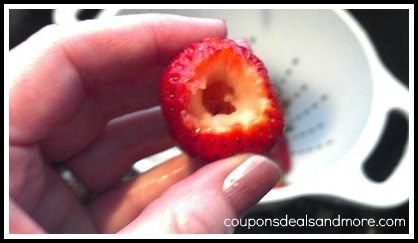 • You will now see the leftover bit of stem core that is inside the strawberry. That is what you are removing. • Insert your knife on the outside of the yellowish part of the leftover leaf core. 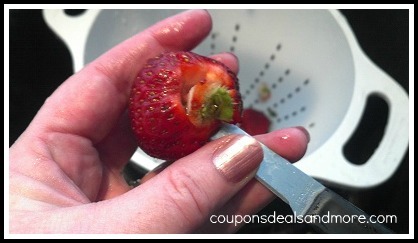 • Make an incision all around that yellow part, and then flick your wrist to “pop” it out. It will remove easily. • You can now see clearly inside the strawberry, and all the is left is the sweet, juicy fruit and not the tart stem. Easy-peasy! That is how to hull a strawberry! Let me give a shout out to that dang camera! I am seeing some BEAUTIFUL pictures. I love love love this post also. Can you ask Mr. Entitled if he would mind doing a dicing veggies basics for us? I am trying to bring him back to his roots lol! Oh that’s a good one, T! He cringes when I pick up a knife because I don’t “do it right”, but I have to say he is really good at slicing and dicing. I agree about the dicing veggies. How in the world do people dice up itty bitty tiny carrots and peppers and have them all come out to uniform?